Pardon me for being so tardy in posting, but I've had a very busy month. I thought I would be out of action for a week, but some important things in my personal life needed attention first. As I was out last Friday [September 23, 2005] on account of my wife becoming a U.S. citizen, those I told may likely ask how it went. As it was a wonderful event, I don't think I could do justice to it by saying "it went fine" and mentioning some scant details in the few minutes we sometimes have between projects and meetings. So here I'll just describe the event briefly and include a few pictures as well. This was the first time I've attended a naturalization ceremony and swearing of an oath of citizenship. 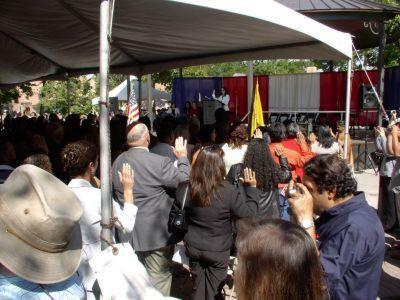 More than 220 people from 54 countries were naturalized, and this was just at one ceremony in Santa Fe, New Mexico. 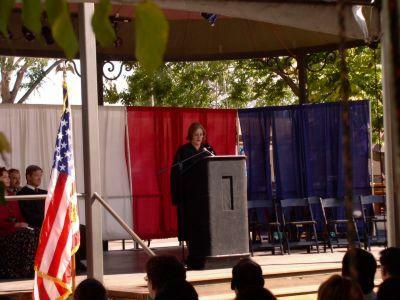 At the ceremony, the Honorable Judith C. Herrera of the U.S. District Court presided. During the ceremony, as each country was called out, all the candidates from that country stood up. Among the candidates some were military personnel, in uniform. Soon after everyone was introduced by their respective countries, all the candidates took the Oath of Citizenship. I am a natural born U.S. citizen, and this is my first time hearing the Oath of Citizenship. As someone who grew up in America, I kind of know all the obligations of being a U.S. citizen. If there is a war and you are required by law to fight, you must fight. If there is some national work that is required then it must be done. Yet I think it is also true that in the last forty years the sentiments for these commitments have been somewhat weakened, at least among us natural-born citizens. So to hear the Oath of Citizenship in the context of a solemn ceremony, keeping in mind what these candidates for U.S. citizenship are actually giving up and the staggering number of countries they come from, I was impelled to rethink the meaning and value of U.S. citizenship. 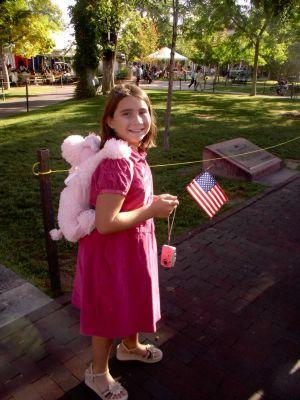 Those of us born as U.S. citizens are more susceptible to think of citizenship as a right, but the ceremony and oath conveyed most eloquently that citizenship is really a privilege--even for those of us born as U.S. citizens. The guest speaker was Dr. Lourdes Monserrat, an expert in Latin American studies, educator, and social activist. She came to America from Cuba through the CIA's Operation Pedro Pan (Peter Pan), which from 1960 to 1962 evacuated 14,000 children from Cuba. After her evacuation she was soon reunited with her brothers and sisters (also evacuated through Pedro Pan), and then later with her parents, who she says escaped on the last boat form Cuba. In an anecdote about her time in Honduras as a teacher, during the Watergate affair, she related how her Honduran students, colleagues, and friends were genuinely perplexed that the president of the United States of America could be asked to step down on account of lying. For them, such behavior was to be expected from politicians. Her response was that this was one of the things that made America great--in America no one is above the law, what to speak of above moral behavior. She ended her speech by telling all the candidates that America is very generous to those who work hard and those who seriously pursue education. She furthermore emphasized the need and importance of voting, and that as a citizen it is one's civic duty to dissent wherever wrongdoing is discovered. For me the ceremony was a side of America I had never seen. I can't think of any time where I've been in the presence of so many people from so many different countries, and, embarrassingly enough for me, it was the first time I had heard the Oath of Citizenship--something many of us natural born citizens never hear. I am grateful I had the opportunity to attend, and I am personally pleased that my wife is now a U.S. citizen. The Honorable Judith C. Herrera, U.S. District Court. All the candidates taking the Oath of Citizenship. 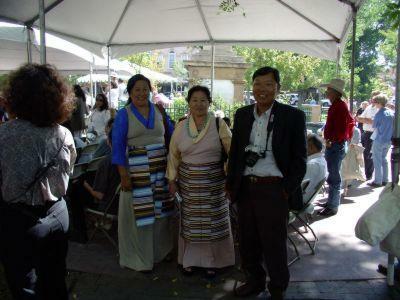 These two Tibetan ladies became U.S. citizens. Both had been in the U.S. for the past 7 - 8 years. 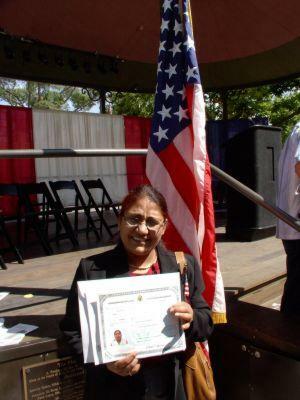 This is my wife, Usha, with her certificate of naturalization. Congratulations! And it's nice to see you back. I saw "Moscow On The Hudson" again last month - after 20 some years. As a depiction of the joys and sorrows of living under an oppressive state, longing for freedom, working through the confusions such freedoms represent, and coming to terms with it, this remains a moving cinematic experience. Your account of a citizenship ceremony reminds me of a similar scene in the film - although it takes place in New York City instead of New Mexico! Please see it sometime.